Comic Book Writer Marjorie Liu On How Rejection Shaped Her Writing Author Marjorie Liu writes adult fantasy novels that explore alienation and identity. And they've attracted a large, diverse fan base. 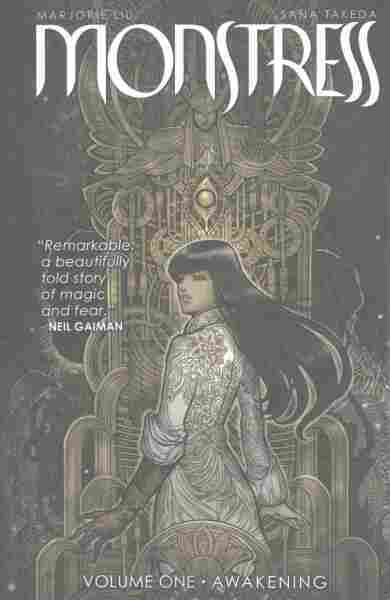 Her latest is the Eisner Award-nominated graphic novel Monstress. San Diego Comic-Con is over. Nerds from all around the world have packed up their costumes, wiped off their makeup and left the city. Many of them will bring home more than just collectibles and photos. They'll also bring back memories of meeting their favorite artists and writers. "Thank you guys so much for making this book," 26-year-old Jessica Wooden said as she approached the table, "It's eye-opening," she laughed, "and it's just great." Liu looked up and smiled. "That means the world to us. Thank you so much," she said, handing the book back to Wooden. Liu is no stranger to Comic-Con; she's been going to the convention for years. Before Monstress, she wrote X-Men comics for Marvel. And before that, she wrote X-Men fan fiction (often shortened to "fanfic"); new stories about established characters. "You know, this is interesting," she says. "People either fall into two camps, where they're pro-fanfic or they're anti-fanfic. I would not have had the skills to write and publish my first novel if I hadn't been writing fanfic." Back then Liu was a lawyer, but she wanted to write, so she poured her creative energy into the world of fanfic. She says she liked the absence of pressure: "I felt completely free to write whatever the hell I wanted, and to go in and be bananas!" That writing practice helped Liu develop her muscles and her voice as a writer. When it came time for her first novel — a paranormal romance called Tiger Eye — she says the transition from being a lawyer to a full-time, professional writer was easy, and Tiger Eye grew into a series of romance books populated with fantasy creatures like gargoyles, mermen and shapeshifters. Liu says she was drawn to those creatures because they're outcasts in the human world, and she wrote them as characters longing to find acceptance and a home, places to belong. 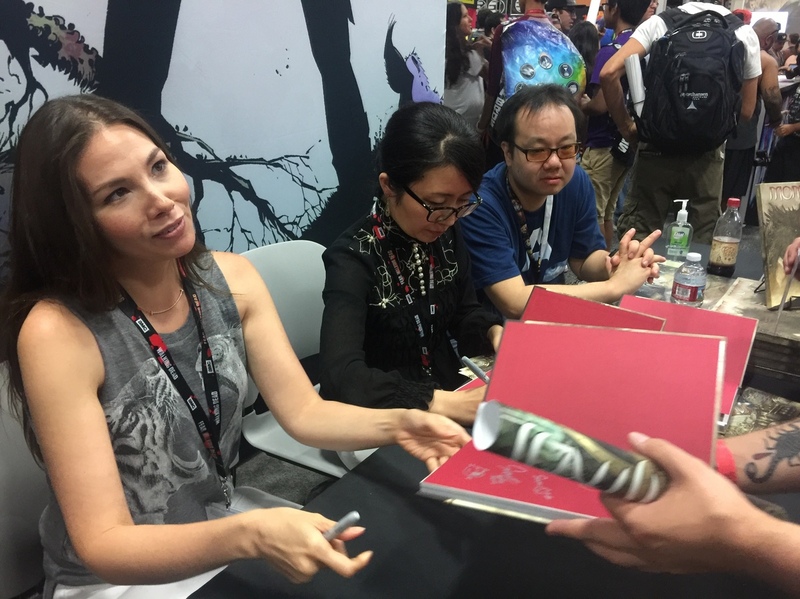 Marjorie Liu signs copies of Monstress at San Diego Comic-Con. "If you'd asked me ten years ago to describe the books I was writing, I would have said, 'I write about gargoyles and mermen," she muses, "but now with time and distance, I can say very clearly that what I was writing about were my experiences as a child." Liu is biracial, the daughter of a white woman and a Chinese man. As a child, she was comfortable with her Chinese identity, but that changed when she became an adolescent. As she tried to join Chinese-American clubs at school, she was turned away. "I was told, 'well, you don't need to be here because you don't look Chinese enough,'" she remembers. "'And you don't need us because you can pass as white.'" She says that confused and hurt her. "I felt very Chinese, but then I was trying to reconcile that with not feeling welcome." Young adult novelist Sarah Kuhn is also biracial, and she tells me that as an Asian-American woman, Liu's writing was very important to her. "Seeing her out there ... was a big inspiration for me. It was really one of the things that got me to finally admit that not only I wanted to write stories but I wanted to write them in the sci-fi fantasy superhero genres I'd grown up loving." Both writers have been shaped by feeling like outsiders. Growing up part-Asian American, they rarely saw people like themselves represented in books or tv or movies. For Marjorie Liu, that's one of the reasons she gravitated — both as a reader and as a writer — to the X-Men, and stories of mutants who were ostracized from broader society. "As someone who witnessed racism and experienced racism, to read these stories about people who didn't belong — even though they were human beings, they weren't quite considered human — and that resonated with me on a powerful level," she says. If you'd asked me ten years ago to describe the books I was writing, I would have said, 'I write about gargoyles and mermen ... but now with time and distance, I can say very clearly that what I was writing about were my experiences as a child. So Liu makes it a priority to put women of color, especially Asian women, at the center of Monstress, which takes place in an alternate version of Asia. The world she's created is made up of women who don't fit into neat little boxes. "That was my goal through this book to show women in all their great and wonderful diversity. Women who are good, women who are evil, women who are in uniform, women in all straits of life and power — and that they are fully realized." Liu says she's also tired of seeing television shows that focus on men, or have larger ratios of men to women. Monstress, she says, is a direct response to that, with a world primarily populated with women. "No, men have not been destroyed, there are still men in the world," she says, "but they're background in the same way that women are so often background in stories that are told about men." For Fay Katayama, who stopped by Liu's booth one afternoon to get her book signed, that's just one of many reasons she's a fan. Katayama is a lawyer, like Liu used to be, and she's feeling unfulfilled with her job. She takes heart in seeing Liu's success. "Just to see someone take that courageous leap, and go do something creative which is not always lucrative is inspiring." For her part, Liu loves to connect with readers like this, and she hopes her work continues to inspire others like her to write. "To all the young kids of color — and not so young," she says, "people who want to use their voices, who are thinking 'this seems difficult because I don't see myself out there,' I tell you: You must be persistent because we need you. We need you so, so badly." Judging by the lines of fans extending well past her booth, Liu's message is definitely being heard.